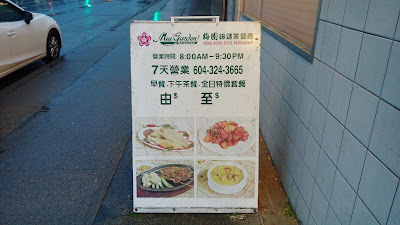 After trying out all the locations of Mui Garden Restaurant 梅園粉麵茶餐廳 in 604, including the branches that no longer exist, the outlet on Victoria Drive near 41st Avenue in Vancouver is our preferred fix. 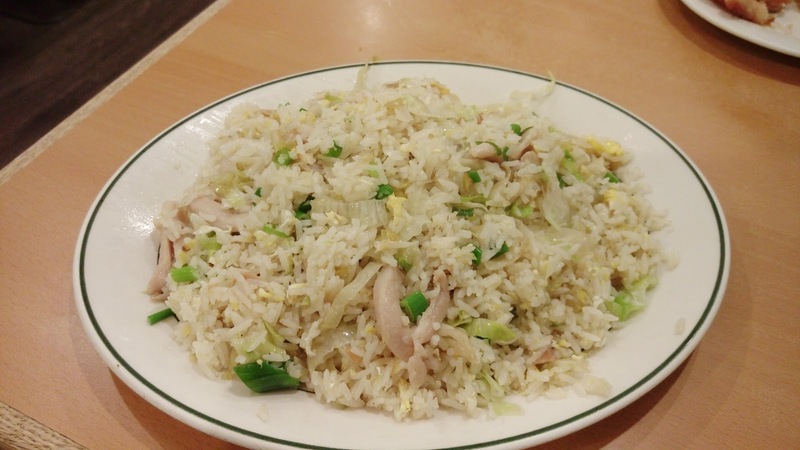 Most diners, including us, often visit Mui Garden for its famous Hainan chicken and/or the coconut curry, but this divey joint also offers beloved HK-style cafe food and classic Chinese dishes. Our visit this time involved no Hainan chicken nor coconut curry. 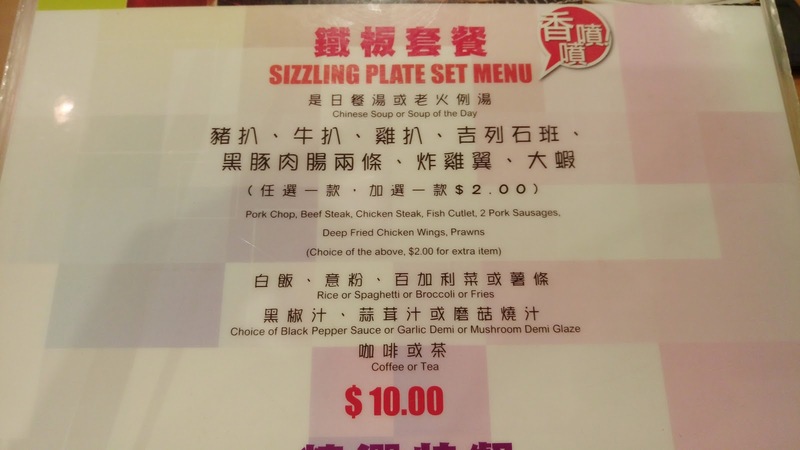 Instead, we went with other popular items on the menu such as the Sizzling Plate Set Menu 鐵板套餐. 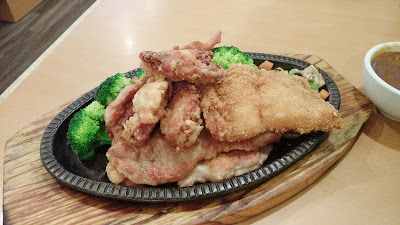 Buddha Boy had four types of meats: Pork Chop 豬扒, Chicken Steak 雞扒, Fish Cutlet 吉列石斑 and Deep Fried Chicken Wings 炸雞翼. Between rice, spaghetti, broccoli and fries, Buddha Boy opted for Broccoli 百加利菜. Dipping condiment was Mushroom Demi Glaze 蘑菇汁. 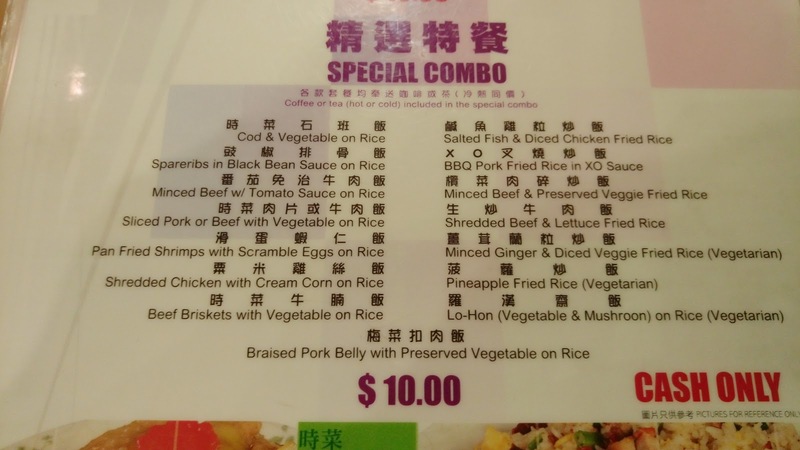 The pork chop and the chicken steak were lightly seasoned and pan-fried. The meats were tender, but that was pretty much it. The cod cutlet was a large piece but it was overcooked. The wings were also overcooked to the point where the meat was dry and the outer coating became a hard crunch. The greens were simply blanched. 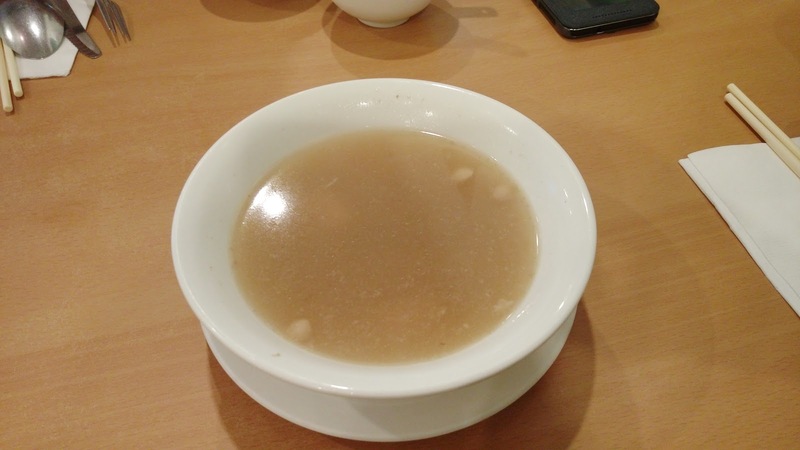 The dip was powdered beef gravy with very small amount of button mushrooms. The first dish I ordered was the Steamed Pork with Preserved Vegetable 梅菜扣肉, one of my favorites at Mui Garden. The mui-choy was cleaned well with a respectable savory fragrance. 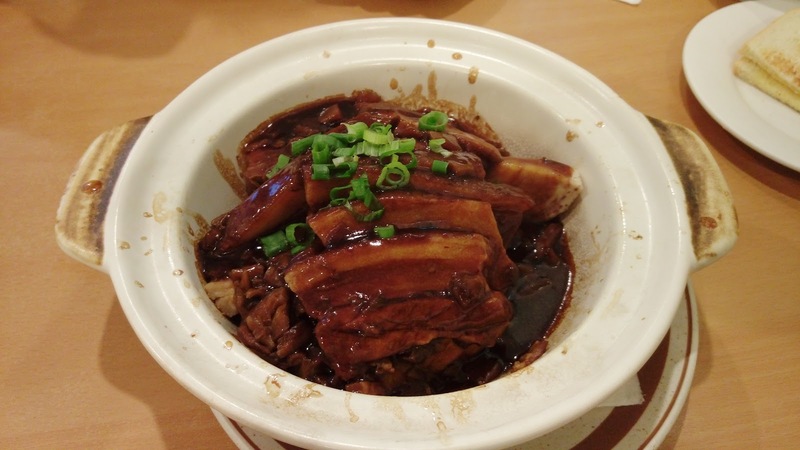 Each piece of tender pork belly had just the right amount of melt-in-your-mouth fat ratio. Other than the usual pork belly and mui-choy, there was also a bed of taro chunks, which added a starchy aroma to the overall package. My second order was the Stir-Fried String Peas with Brown Sauce 干扁四季豆, which was also another favorite of mine. 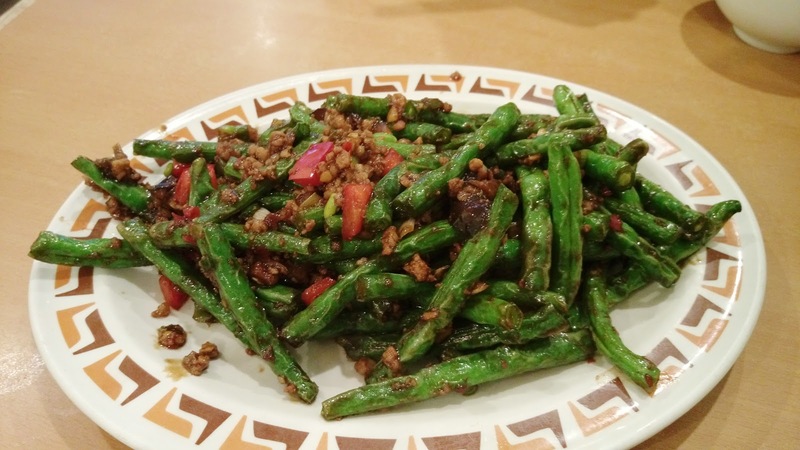 The beans were perfectly deep-fried to soften the waxy nature and to add that extra crunchy texture. The brown sauce was mix of ground pork, garlic, red chili, scallions, soy sauce, salt and sugar. Yes, this dish was salty to be eaten on its own so having this with rice is highly recommended. My orders of mui-choy pork and the string beans came with complimentary Chinese soup of the day, Kudzu & Pork Bone Soup 粉葛煲豬骨. 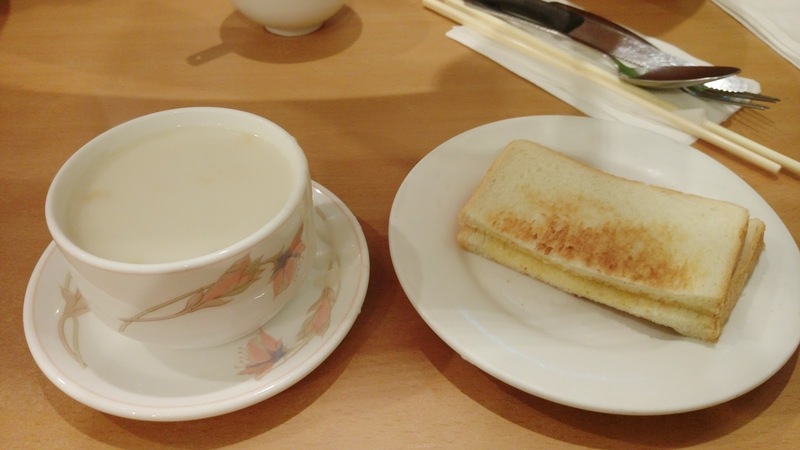 Buddha Boy's hot plate combo was served with the complimentary Cream of Corn Soup 粟米忌廉湯 and a slice of buttered toast. A drink was included with the fried rice and Buddha Boy asked for an unsweetened cold Lemon Tea 凍檸茶. Honestly, while we do enjoy dining at this neighborhood restaurant, price points are not the most ideal for a lot of the items. Buddha Boy's grill plate was $16.00CAD but the portion was smaller than what we had at Silver Tower 銀座 in Richmond (for less the money too). Service, well, similar to most HK-style cafes, don't expect much.